Corinne's discovery of more than 100 letters brought unexpected insights and connections. In May 2017, she found her mother's stash of letters from 16 servicemen that she had corresponded with in 1944-1945. Most of the men were from her mother's hometown of Allentown, Pennsylvania, or from her college roommate's hometown of Trenton, New Jersey. Nearly all of the writers were now gone and could no longer offer information or explanations for what they had written. Corinne began to trace the soldiers' family trees with one goal in mind: to return the letters in person to their children. Learn about her on-going project, and hear some of the stories of the men, their experiences, and what their relatives have to say today. This presentation links history and genealogy to present-day research and diligence. It revisits a time that we may not want to forget. And it may prompt audience members to wonder for themselves what treasures may be lurking in their own old family boxes -- and how they can share the information with others. This is a 90-minute talk with computer slides. Based on the blog, Mom's WWII Letters. 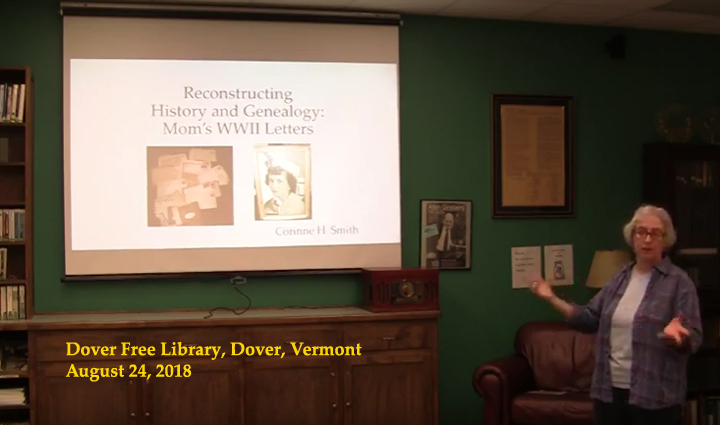 Reconstructing History & Genealogy: Mom's WWII Letters, Corinne's presentation, Dover Free Library, Dover, Vermont, August 24, 2018. Recorded by Brattleboro TV. 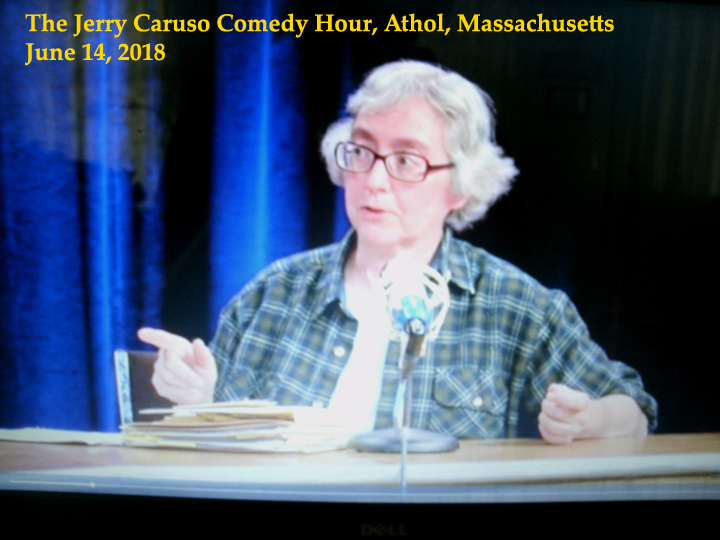 The Jerry Caruso Comedy Hour, Orange, Massachusetts, June 14, 2018. Recorded by AOTV. Corinne talks with Jerry about the letters and her programs. "Writer Connects History and Genealogy," by Chris Mays, Brattleboro Reformer (Vermont), July 27, 2018. 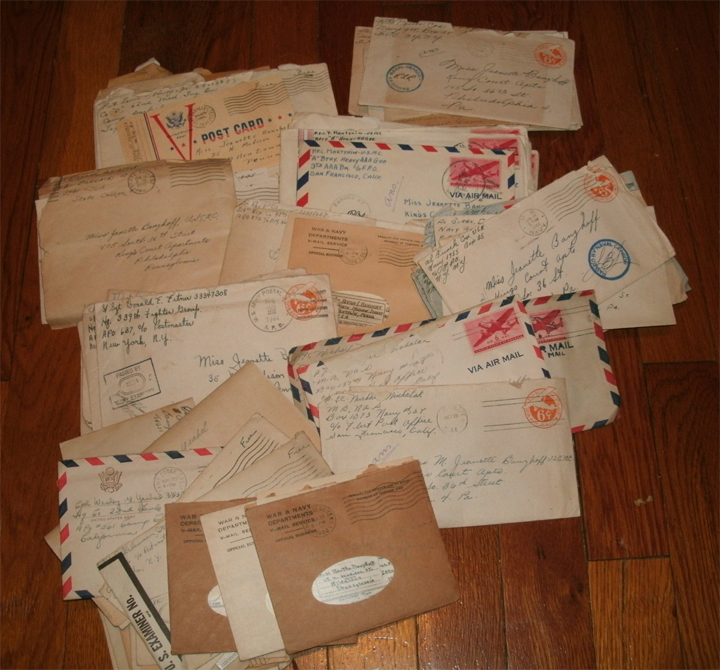 "Woman Finds Trove of WWII V-Mail from Allentown Soldiers," by Christina Tatu, The Morning Call (Allentown, Penna. ), June 27, 2017. Some of Mom's WWII letters, found in an old family box.